In my last post, I gave an overview of the tour. In this post, Paul and I will list the frequently asked questions during the tour and provide our answers. Expression Media unifies the asset management process across tools in the Expression Studio, and across designer and developer collaboration since both can use Expression Media as a central view and repository for the overall assets associated with a project. Designers can use Expression Design together with Expression Blend to incorporate visual elements that are exported as XAML(Extensible Application Markup Language) markup, thus preserving the full visual resolution and fidelity throughout the design process. Expression Design can also export images as JPEG, GIF, or PNG files for incorporation with Expression Web for standards-based Web sites. Expression Studio also includes a full copy of Visual Studio 2005 Standard, for greater capability in developing and debugging code for applications designed in Expression Blend. This designer/developer collaboration can occur between individuals on a team or by more technical designers who will appreciate Visual Studio’s advanced development capabilities. Expression Media makes digital asset management easy by enabling creative professionals to keep their focus where it belongs – on being creative. With drag-and-drop import for more than 100 file types, Expression Media is the perfect choice for centralizing digital assets, including images, video, audio, graphics, fonts, HTML, XML, etc. files created in Expression Studio. Expression Blend shares Visual Studio solution and project files which allows easier collaboration between designers and developers who can now have the identical “project view” into the source tree, and can share build process with either designer/developer testing the solution with the familiar F5 keyboard shortcut. 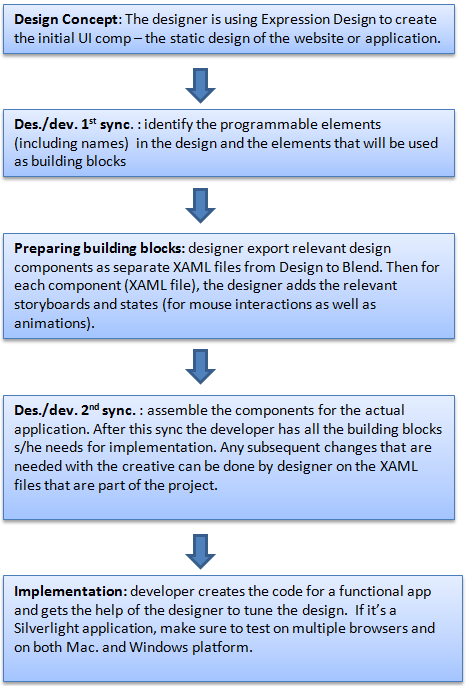 XAML code files can be opened and edited in both VS & Expression, and iterated upon in either product without breaking compatibility or compromising the design in the process. Expression Web and Visual Studio can be used in collaboration by teams developing and designing websites. Expression Web offers an advanced CSS design surface, which can be paired with Visual Studios development, data, and testing capabilities. Websites can be opened and modified by both tools at anytime, with fully standards compatible code in XHTML, CSS, ASP.NET, XSLT, XML standards being generated automatically or by hand. The Metaliq Top Banana demo Danny showed during the presentation were created by a team of 2 developers, 1 UI designer/developer, and 1 interaction designer in 3 weeks. Channel 9 has a great video talking about how Designers and Developers worked together on real-world WPF applications. Silverlight is a web browser plug-in for delivering media and rich interactive applications (RIA) for the web. It runs cross-platform (both Mac and Windows) and cross-browser (IE, Firefox, Safari, and Opera). Silverlight will be used for broad reach interactive media content and browser-based experiences which require cross-platform support and fast and easy deployment. Windows Presentation Foundation (WPF) is part of .NET Framework 3.0. It is used for building rich immersive applications and experiences that can take full advantage of the Windows platform, including UI, Media, offline communication and Document support. WPF applications can be deployed using ClickOnce or run in IE browser. Both Silverlight app and WPF app use XAML to mark-up UI. WPF provides even richer user experience than Silverlight applications. For example, WPF applications can utilize 3D acceleration, GPU rendering, and local file manipulation. However, Silverlight runs cross-browser and platform. Silverlight Pad is a great demo for illustrating XAML. You can see how XAML mark-up complex vector graphics such as the bug and camera examples in the demo. You can see how to using XAML code to create simple animation in the rotating movie clip example. Try to edit the XAML code in the bottom code view and see how the examples change without even compiling the code. The video delivered by Silverlight Streaming service can be viewed here. Some of the scenarios for Flash and Silverlight usage are similar, such as rich media/video within websites, or interactive rich content for e-commerce, e-learning, or advertising. However, Silverlight uses a dramatically different approach for creating and delivering experiences in a way that aligns more with our customers development and deployment needs. First of all, Silverlight is part of our UX platform, which spans from Windows to the Web, and include emerging surfaces such as the media/living room (Xbox360, Media Center PC), as well as mobile devices. Each of these platforms has shared capabilities and development tooling, but greatly different performance and integration characteristics. Similar to developing Windows based desktop application, Silverlight apps can be developed using Expression Studio and Visual Studio. I’ll be posting there every day about my experiences using the software. And I’ll definitely check in with this site again ’cause this stuff is quite exciting.